PORTLAND, Ore. (May 23)- From Fort George to Worthy and on to Gigantic, the Cosmic Collaboration Series from Ecliptic Brewing has most recently been Oregon brewery focused. This time around however, Ecliptic looked out east for their next collaboration partner. Melvin Brewing from Alpine, WY traveled to Portland to create a beer that defies all explanations. 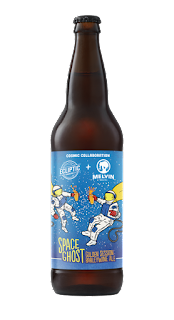 The Cosmic Collaboration is playfully named, Space Ghost Golden Session Barleywine and takes inspiration from Melvin’s illustrious Imperial IPA’s. 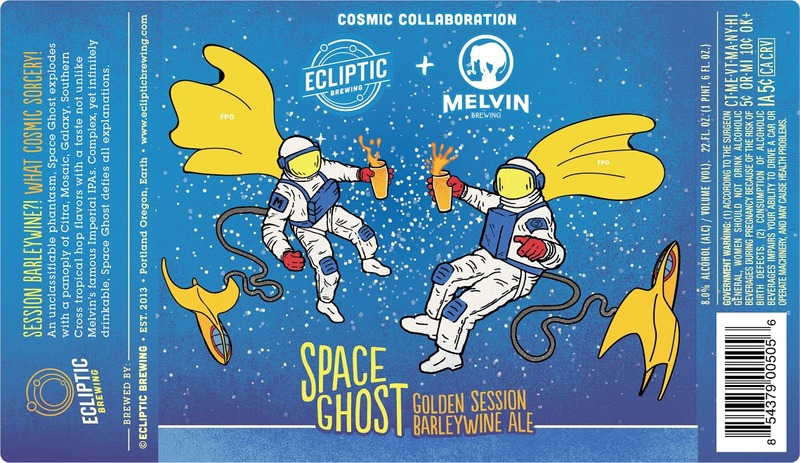 “When Jeremy Tofte (Co-Founder/Field Hoperative at Melvin Brewing) and I first talked about this beer he wanted to make a barleywine,” said Owner and Brewmaster of Ecliptic Brewing, John Harris. “I thought a barleywine in the summer? No way! That’s when the idea for a golden session barleywine was born.” said Harris. Session Barleywine?! What cosmic sorcery! For high res image of the Space Ghost label, visit here. For high res image of the Space Ghost 22oz bottle, visit here. 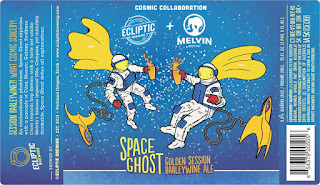 Space Ghost Golden Session Barleywine will be available in draft and 22oz package throughout Ecliptic’s distribution network starting early June. · Portland, OR. 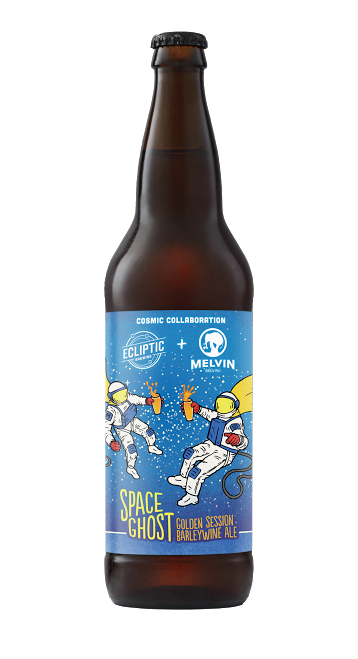 Ecliptic+Melvin Space Ghost Release Party. June 6th, 5-7pm. The Side Street Tavern, 828 SE 34th Avenue. · Seattle, WA. Ecliptic+Melvin Space Ghost Release Party. June 15th, 6-10:30pm. TeKu Tavern, 552 Denny Way. Ecliptic Brewing is a venture from John Harris, an Oregon beer icon whose background is steeped in the state’s rich craft brewing history. The name Ecliptic unites Harris’ two passions: brewing and astronomy, and as such, the brewery celebrates the Earth’s yearly journey around the sun through both its beer and restaurant menus. Executive chef Michael Molitor rotates his seasonally inspired menu every six weeks in accordance with the old world calendar. Harris’ signature beers include Spectra Hoppy Pilsner, Orbiter IPA, Carina Peach Sour Ale, and Capella Porter. For more information, visit: www.eclipticbrewing.com. Ecliptic beers are available at the brewery (825 North Cook St), in package and on-tap throughout the area, and distributed by: Maletis Beverage (Portland, Salem, Vancouver WA), Bigfoot Beverage (Eugene, Bend, Coast), Fort George Distributing (Northern Oregon Coast), Summit Distribution (Southern Oregon), Click Distributing (Seattle, Tacoma, Spokane, Northern Idaho), Dickerson Distributing (Bellingham), Crooked Stave Artisans (Colorado), Freedom Distributors (North Carolina), BeerThirst (Canada), and Graybeal (Eastern Oregon).